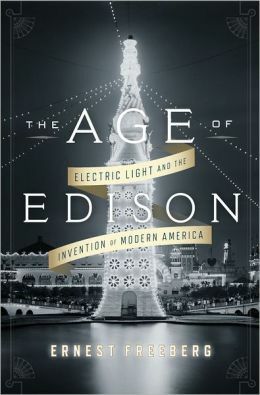 Dare I say Ernest Freeberg’s The Age Of Edison: Electric Light and the Invention of Modern America is an illuminating read? This book chronicles the late 19th century and early 20th when’s, where’s, how’s and most importantly the who’s of electricity coming into everyday usage. We take our light for granted but there was a time when people used dangerous gas burners for light and didn’t so much do so much when the sun went down. We just assume our electricity will pulse through our homes for our constant use, but there was a time when only the very rich could afford that privilege. Of course you’ve heard names like Edison, but what of Charles Brush? Did you know of the competition between the UK and the US in attempting to find a solution to a long lasting incandescent bulb? How about the opposition to people working night shifts with the advent of indoor light and early accidents (quite a lot less then you’d expect)? We pretty much span the globe, visit towns, cities and amusement parks and learn the nuts and bolts (if you will allow me) through the painstaking research this over 300 page hardcover includes. It’s a chunky read at times, but it’s also a vibrant story of a time not so long ago when the world was literally transformed by an invention as startling and innovative to its people as our digital progress is to us today. And in fact, without all this electricity where the hell would we be today? I can’t recommend Ernest Freeberg’s The Age Of Edison: Electric Light and the Invention of Modern America enough.